KIEV, Ukraine -- A dispute between President Petro O. Poroshenko of Ukraine and the billionaire governor of one of the country’s regions over control of two state-owned energy companies widened Monday, confronting the new Ukrainian government with its most serious internal crisis since coming to power last year. Until the dispute burst into the open last week, the governor, Ihor V. Kolomoisky, had been among the Kiev government’s staunchest allies. Militias financed privately by him have played a crucial role in stopping pro-Russian separatists waging war in the east from advancing into the heart of Ukraine. Mr. Kolomoisky emerged from the building soon after, to say his men had just thwarted an attempt by “Russian saboteurs” to take control of UkrTransNafta. Confronted by journalists about his unusual presence there at such a late hour, Mr. Kolomoisky cursed at them in a ferocious diatribe that was captured on video, as was the raid itself. Highlighting that risk, Mr. Kolomoisky in his remarks to reporters noted that on his command, 2,000 armed men could be brought to Kiev within hours. Still, the commander of Mr. Kolomoisky’s main paramilitary group, Dnepro-1, denied any involvement. By Monday, no armed men were visible outside, though the group loyal to Mr. Kolomoisky apparently still occupied the building. Valentin Nalivaichenko, the director of the security service, told reporters on Monday that his agency would help the police arrest the men occupying the building. “We confirm that the police and journalists have noticed illegal actions by people with weapons” in the capital, Mr. Nalivaichenko said. Dnipropetrovsk is widely considered Ukraine’s most important industrial region, and its capital of the same name, located about 300 miles southeast of Kiev, is the country’s fourth-largest city. 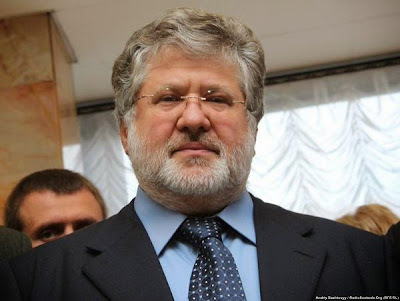 Mr. Kolomoisky was one of several oligarchs, considered too rich to bribe, who were appointed to leadership positions in a bid to stabilize Ukraine. Mr. Kolomoisky, widely known as a pugilistic character even as he is admired for his patriotism, has shown no signs of backing down. Critics of Mr. Kolomoisky, however, said his actions showed his first allegiance was to his own wealth. Mustafa Nayem, a young member of Parliament from Mr. Poroshenko’s party, urged the president and Prime Minister Arseniy P. Yatsenyuk to oust Mr. Kolomoisky. “Igor Kolomoisky has no right to wear the title of a public servant,” Mr. Nayem wrote in a blog post.